Garth Arum are the solo-outfit of As Blood Dies’ Oscar Martin ‘Nightmarer’ Diez-Canseco, a project this guy started at the end of last century. Throughout all these years, Nightmarer wrote material for this project specifically, but because of his duties in As Blood Dies and several other bands, he did not have the time to record anything decently. But in 2009 he started recording the material he had been working on for years, and it will end up in a triptych, from which the Dawn Of A New Creation is the first part. The whole recording process of this debut took place at his Fireflowers Studio, mix and mastering included, and Nightmarer worked with some guests on vocals, like female singers Cecilia Tallo and Lady Carrot, and Smohalla-members Camille Giraudeau (the guy behind Stagnant Waters) and Vincent ‘Slo’ Cassar (also known from Phlegma). And oh yes, As Light Dies violist Jesus ‘Strudle’ Villalba appears as session violin player on one track (Trip Part I) too. 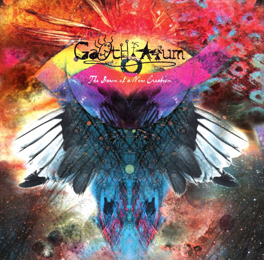 Garth Arum’s musical journey is based on dreams and fairy-tales, with the human psyche, seen from an introspective vision, as result. The Dawn Of A New Creation clocks nearly one hour and opens with the short (two minutes of length) intro A New Creation. It’s some kind of symphonic and progressive Extreme Metal, with the ‘usual’ instruments, as well as piano, female voices and ambient New Age-oriented synths. …something like Philip Glass covered by Strapping Young Lad… Shadows Of The Past too begins with piano, but soon different other angles turn in. And that’s more or less the history behind the whole album. Not once there is one single line that lasts for more than a minute. Diversity, it is the keyword behind this sonic trip. And it goes for all aspects: vocals, melodies, song structures, executed genre, atmosphere, etc. Avant-garde pieces interchange with Black / Death-oriented ones, bombastic parts with sober, integer ones, atmospheric passages with extremely heavy ones, traditional excerpts with modern ones, electronic influences with classic ones, ambient atmospheres with down-earthed ones, and so on… And in one way or another, Garth Arum succeeds to create a cohesive piece of sonic craftsmanship, despite the overload on impressions you might undergo. The Dawn Of A New Creation surely is a very adventurous, yet mostly difficult album, ingeniously written and composed, but probably / possibly ‘too much’. However, if you can appreciate eclectic material à la The Devin Townsend Project, later Arcturus / Ulver, Maudlin Of The Well, Ephel Duath, Smohalla, Unexpect, Solefald or Periphery, then you might appreciate this multi-layered creation. I think there are too much un-structured gaps, incoherent hiatuses and exaggerated contradictions, but this isn’t but a first part of a trilogy. So I might wonder what the next album will be alike. Once again: benefit of doubt!